JAKARTA, Mar 23, 2018 - (ACN Newswire) - MEIKARTA, the mega residential township project being developed by Lippo Group, has received US$850 million from 19 global partners focused on health & medicine, financial technology, education, logistics and technology research. The partnerships were inaugurated in Jakarta this week with ceremonies signing the memorandums of understanding (MOU). MEIKARTA is the embodiment of Lippo Group's commitment to sustainability and the "five pillars of development"; developing an innovative infrastructure & transportation, a high tech central business district (CBD) & research hub, a business & commercial hub, a center for the arts, culture & education, and green sustainable living. 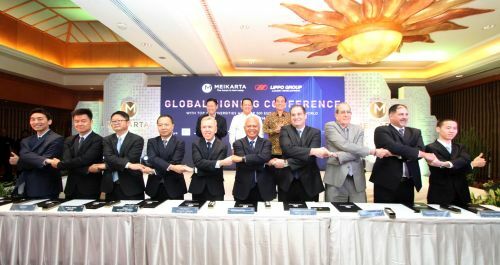 Ketut Budi Wijaya, President of MEIKARTA, said, "This partnership is a confirmation that the world community recognizes and sees MEIKARTA as a modern city of the future. The presence of global institutions, whether in education, health, or technology, will make MEIKARTA more than a dwelling. The MEIKARTA of the future will be the economic center that will grow and develop." Bambang Soesatyo, Chairman of House of Representatives, Republic of Indonesia, said: "I am confident that the presence of these leading institutions in MEIKARTA, with their capital, networking, technology, systems and experience, will support the government's vision of national development". MEIKARTA is in the East Jakarta Corridor, which will be integrated with new transportation networks, including Jakarta-Bekasi High-Speed Rail, Patimban Deep Seaport, Kertajati International Airport, Jakarta-Cikampek Elevated Highway and APM (automated people mover) uniting seven new cities around MEIKARTA. The MEIKARTA development covers 22 million m2 in its first phase, designed since 2014. Work started in January 2016 with the initial construction of one hundred skyscrapers, each with 35 to 46 floors, and the creation a workforce expected to reach 65,000 individual jobs. MEIKARTA surpasses anything the country has ever seen, epic in its scale and vision as a truly integrated city of the future. Not only does MEIKARTA redefine what a modern city should look like and feel like, it sets the new standard for a world city in Southeast Asia and beyond. Visit meikarta.com.